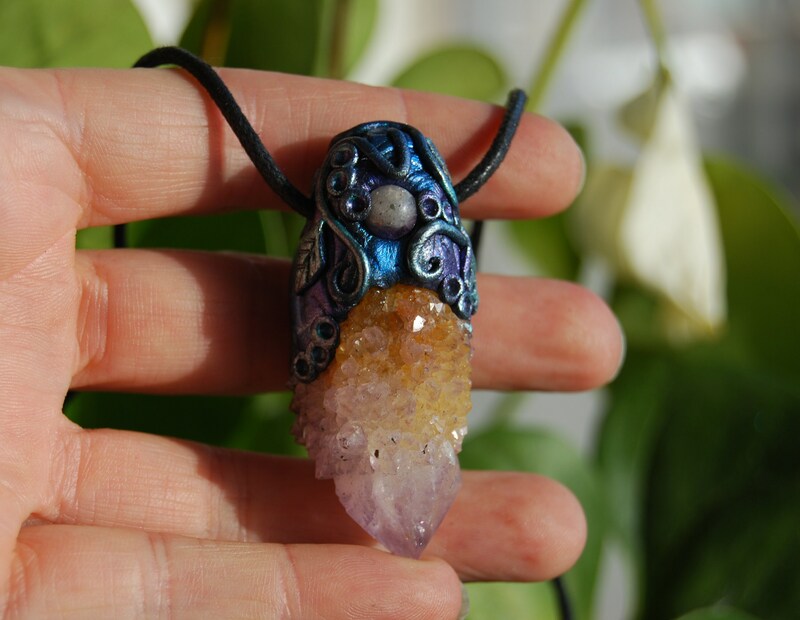 This is a lovely Ametrine Spirit Quartz cluster with a smaller polished Amethyst embedded in a handsculpted durable clay setting that I made myself. 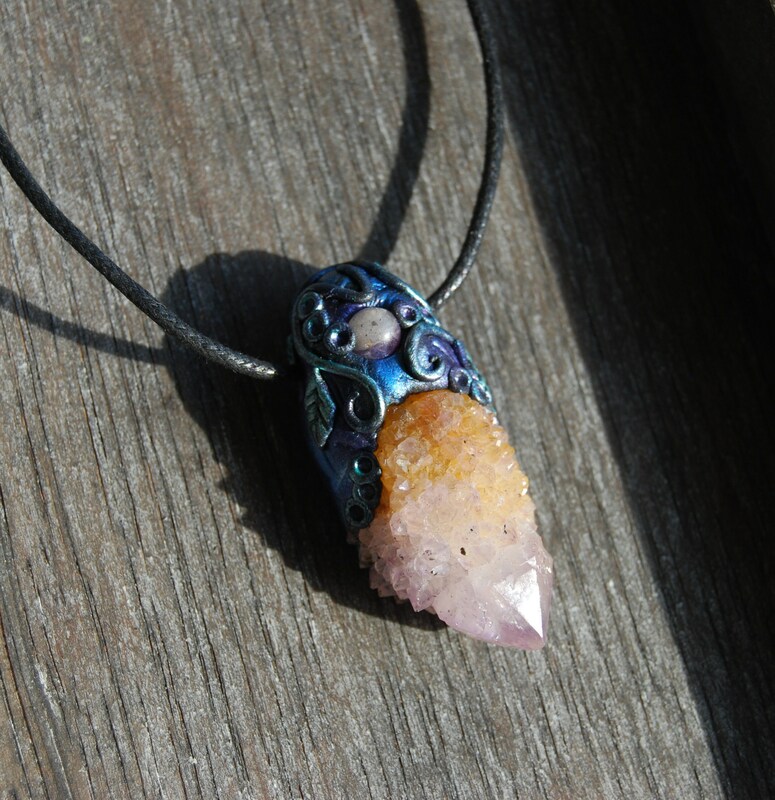 Spirit Quartz is an unusual member of the Quartz family - a community within a stone. Its core, a larger, candle-shaped crystal with a faceted termination point, is encrusted with hundreds of smaller crystal termination points. Also referred to as Cactus Quartz it is found only in the Magaliesberg Mountain region of South Africa, first appearing around 2001. 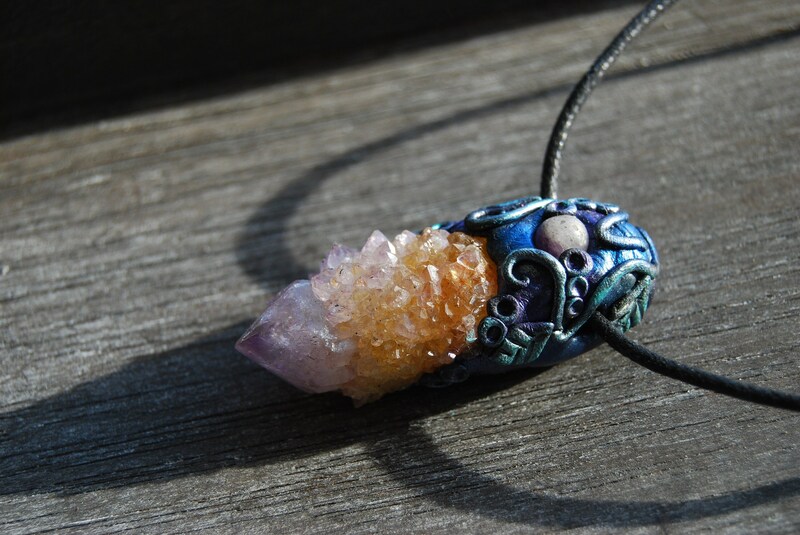 Ametrine's duality (Amethyst and Citrine) makes it a powerful companion for creative, healing and psychic workings. Ametrines' energies are said to stimulate the intellect and rid the aura of negative energy. It is extremely effective in opening psychic doorways in the astral plane. It will provide protection as you journey through these unfamiliar landscapes, and light your way back to familiar ground. In Spirit Quartz, powerful healing energy is directed through the main crystal while also being simultaneously radiated out in all directions by the tiny crystals that cover it. 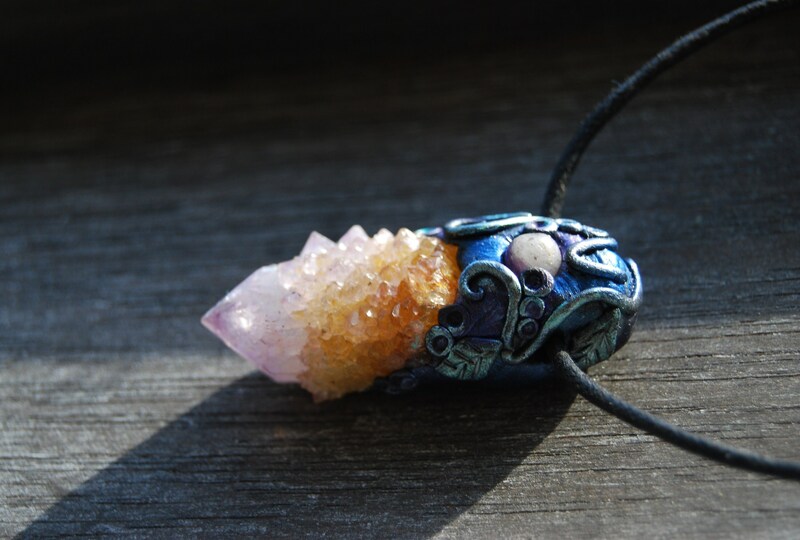 There are many paths the magnified energy of Spirit Quartz can take, and it stimulates on all levels the physical, intellectual, spiritual, emotional and subtle bodies. Simultaneously, Spirit Quartz brings focus to the energetic center of an issue, the “heart of the matter” or the core of dis-ease. Its ability to focus and bring energies together also makes Spirit Quartz an excellent stone for groups. Spirit Quartz fosters unity, peace, and a willingness to work together that is beneficial to families, communities, or businesses alike. 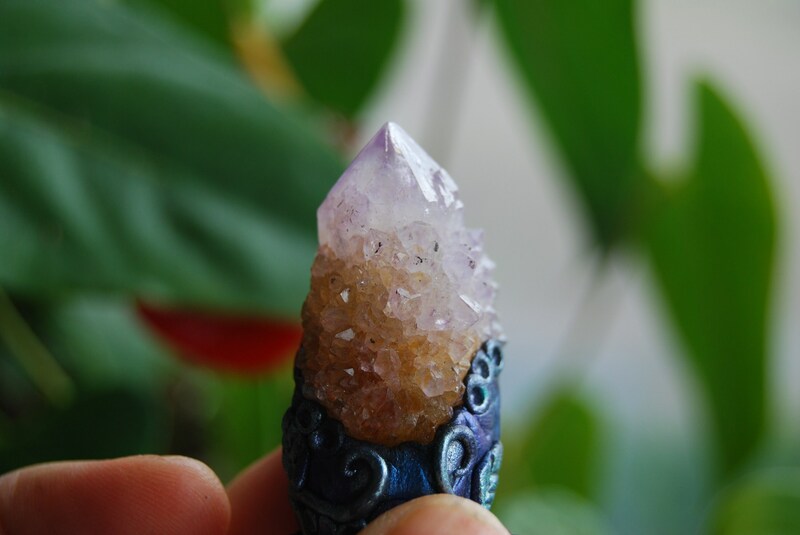 Use Spirit Quartz in group meditations to connect the energies of all participants. Spirit Quartz has been used to heighten experiences with astral travel, shamanic journeying, dream work, re birthing, and meditation. 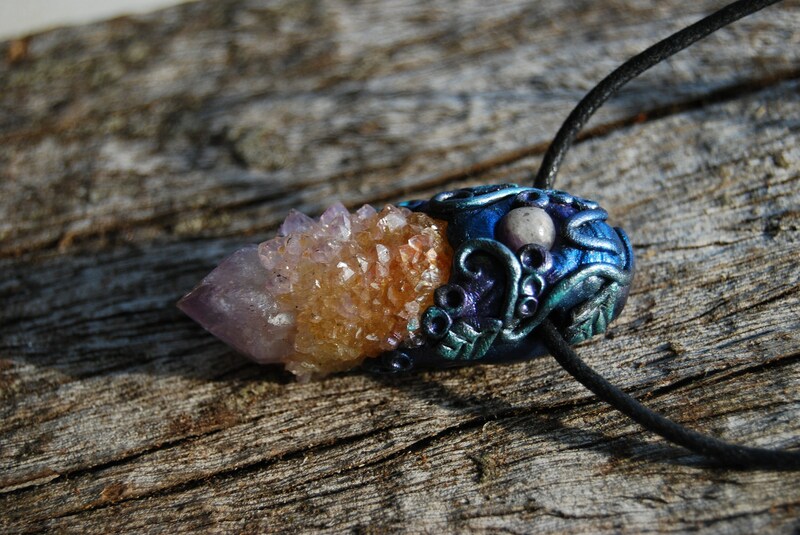 While primarily associated with the Crown Chakra, Spirit Quartz opens and cleanses all Chakras. 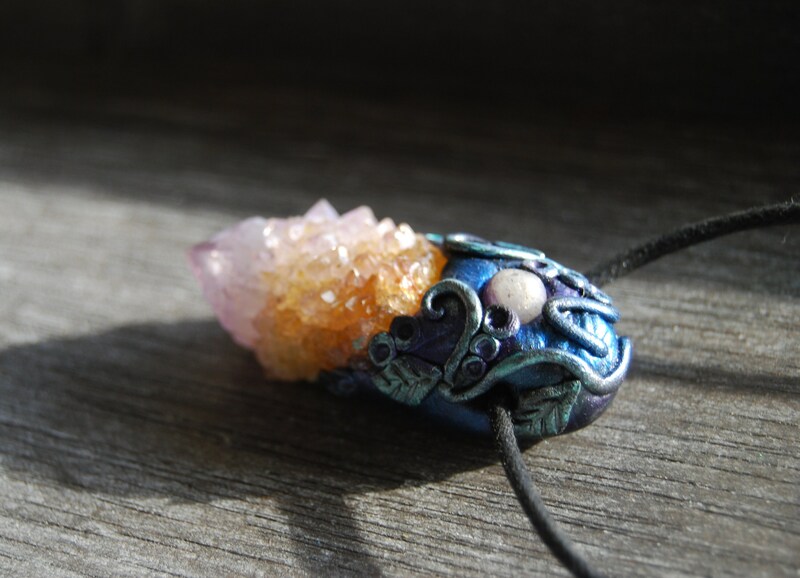 A protective stone, both energetically and physically, Spirit Quartz shields the aura, transmutes negative energy, and protects from physical harm. The sense of calm and peace Spirit Quartz brings helps decrease fears, and makes it an excellent stone to use when dealing with the loss of a loved one, easing the grief of transition. 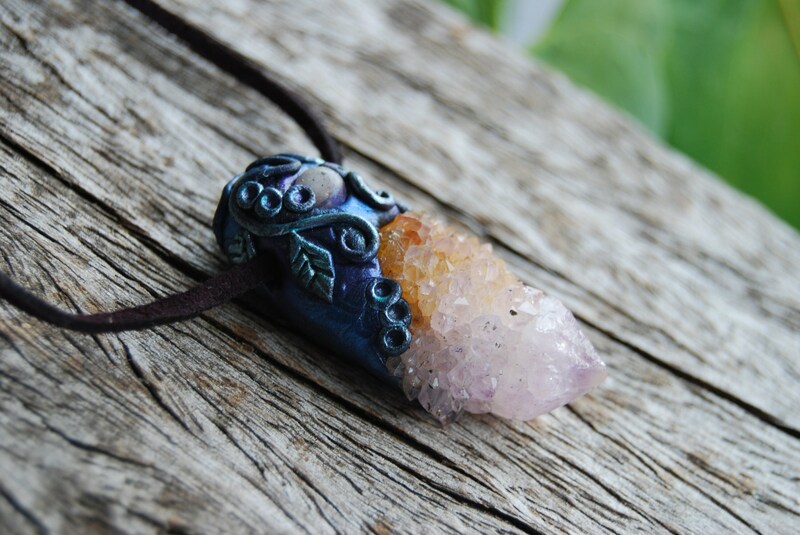 Spirit Quartz can aid to increase physical and intellectual fertility. 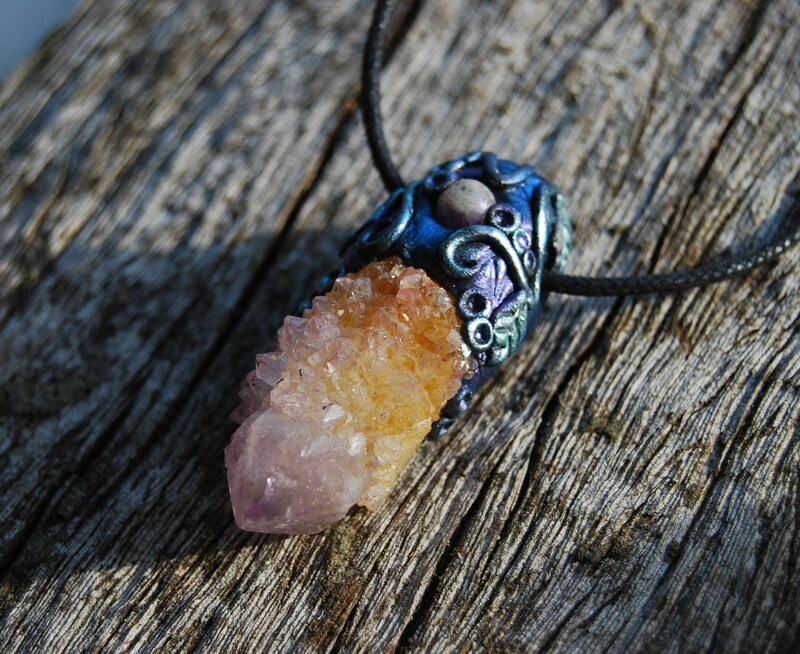 Spirit Quartz cleanses other stones and enhances their energy in healing layouts. It harmonizes well with Tourmaline. Amethyst has a calming yet spiritually protective energy that makes is good for any type of dream work... lucid dream, astral projection, past life regression, prophetic dreams etc.... It can also help overcome insomnia and/ or nightmares for some people and may help the bearer awake very refreshed and energized. It makes a nice addition to herbal dream pillows. Amethyst is considered to be a stone of spirituality and contentment. 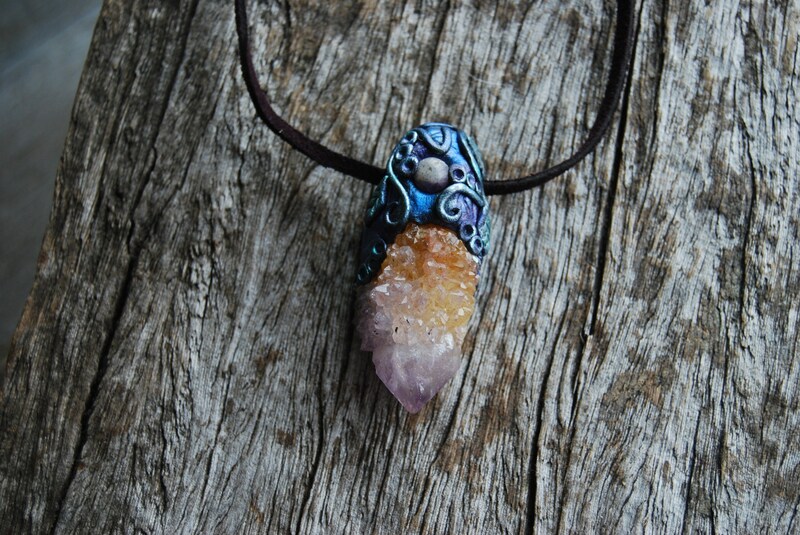 It can help raise a lower vibration energy to a higher one. It is a stone of meditation, peace and healing. It offers powerful spiritual protection on the spiritual planes of existence. It is made with good quality strong durable clay. Some raindrops are fine, but do not swim, shower or bath with it. It comes on an adjustable suede cord. Size is 5.4 cm / 2.12 inch from top to bottom. Will be packed carefully and shipped with trackingnr.